Code faster: with customizable code templates, headers, exception/error handlers, etc. Design faster: with designers to set quickly the name, caption, tabindex and other default properties. Find code faster: with unlimited output windows with trees of results, either to search code, method callers, etc. Generate documentation: in either XML or customizable HTML output formats. Ensure quality and standards: define standards through flexible rules and ensure that the team follows them. MZ-Tools can find strings in a method, file, project, solution or project group, selected text, group of files or group of projects. The results are shown in the following results window, much more convenient than the one provided by the Microsoft IDEs. MZ-Tools can find all locations in your source code where a method is called. The results are shown in the following results window, much more convenient than the one provided by the Microsoft IDEs. With this window, you can choose the values of the enum expression which require a separate “case” statement and you can choose the order of the enum values. 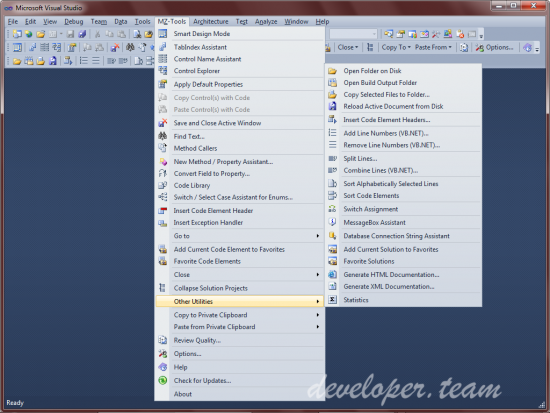 If you leave enum values not selected, a default (C#) or Case Else (VB.NET / VB / VBA) statement is added.